this software download prints booklets or books and saves ink and paper by printing up to 64 pages on both sides of a sheet. The program prints also poster.Create animated GIF files. BookPrint operates as a printer driver that maybe used by any application. 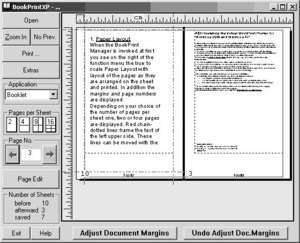 BookPrintXP 10 is a shareware program and can be used as a demo to try the software until the free trial period has ended. A full version of the program is available after the trial period ends. For security reasons, you should also check out the BookPrintXP download at LO4D.com which includes virus and malware tests. Additional screenshots of this application download may be available, too.